A history of song, music and revolutionary working class politics in France from the 1789 Revolution up to the 1980s and punk. Like other political groups, anarchists have seen music as an excellent means of agitation and of popular education, and have made it one of their key activities of propaganda in many countries. 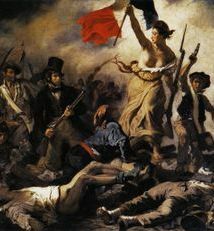 In France, political song had been developed since at least the time of the French Revolution of 1789 when there had been an explosion of song. The particular song form of the chanson has been seen as the key vehicle of political ideas. The supporters of the revolutionary Gracchus Babeuf went so far as to flypost the words of chansons, and to sing them in the streets and in the cafés. In the period 1815-30, Pierre-Jean de Béranger was a pioneer of the political, republican chanson, with his strong anticlericalism, his call for the union of peoples and peace and against tyranny. However, he was essentially a liberal, and was neither revolutionary nor socialist. His songs were popular in the goguettes, a network of song clubs which sprang up in Paris in the 1820s. There, songs about love and drink were sung alongside political and ‘patriotic’ compositions. These goguettes soon came under the scrutiny of the police, who led a campaign of repression against them, closing some of them down. The restored monarchy engaged in a ‘guerilla war’ over the freedom of the press... and of the chansons. At any moment, the police could ban the singing of a song in a goguette. The goguette of the singer Gille had to move several times in order to avoid such attention, for which he finally received a six-month jail sentence in 1847. Normally, the judiciary avoided this because the jury usually acquitted the accused in such cases. The goguettes were a place for workers and artisans to go after work, which explains the predominance of songs about drink and love. But they played a major role in creating the ‘social’ chanson— the working class and socialist chansonniers of the 19th century had their apprenticeship in the goguettes. The utopian socialist Saint-Simon exhorted artists to fulfil their social role as interpreters of ideas. So music and song occupied a key place in Saint-Simonian ideas. All their meetings were accompanied by song and pieces of music, as were those of the utopian socialist Fourier. Fourier, however, did not establish a strict norm for artists, saying that they should produce what they wished. Some ex-Saint-Simonians among the followers of Fourier organised singing lessons among the workers in 1839. The song and poetry of these workers represented the first signs of what Henry Poulaille, in the 1930s, called the proletarian writers — writers from among the people, who continued to live among them, and who represented a form of direct expression on the part of proletarians. The 1848 Revolution brought a new flowering of political songs. Le Républicain lyrique appeared, a monthly magazine supported by the principal goguettiers favourable to the Republic. The reaction to the June Days and the repression that followed led many towards social reconciliation. Only chansonniers like Gille saw the new and revolutionary character of these events, which announced future social conflict. Joseph Déjacque was a man ahead of his time. He wrote poetry and songs putting forward his advanced anarchist ideas, an anarchism that he had evolved in advance of the birth of the anarchist movement. Fraternally criticising Proudhon for his failure to carry his thoughts through to their ultimate conclusion, his ideas were openly anarchist, revolutionary and communist, affirming the individual at the same time. In many ways he was the ancestor of both anarchist communism and of individualist anarchism. He was driven mad by grinding poverty, dying in Paris in 1864. Under the Empire of Napoleon III, cultural resistance through songs continued. One of the most beautiful of French political songs, and indeed of French song in general, still known by many ordinary French people today, is Le Temps des Cerises (Cherry Time). The author, Jean-Baptiste Clément wrote it in 1867, and he wrote many more songs advancing the ideas of socialism, gaining the attention of the police. This period of repression led to the stifling of the goguettes. At the same time another decisive factor in their decline was the emergence of the café-concerts, which became popular generally. The development of caféconcert, then of music-hall, ended the activity of the singer on the edge of a market economy, and opened up song to business and the chance to earn a steady living and indeed have the possibility of becoming rich. In this process, the chansonlost its direct and spontaneous character. It was still a means of communication for the masses, but was more aimed at them than being produced by them, becoming more and more the business of specialists. The bloody repression of the Paris Commune in 1871, with tens of thousands shot, imprisoned and deported, led to a new stage in political song. Pottier, forced to go into hiding in Paris, produced his most famous songs, La Terreur Blanche (The White Terror) and of course, The International. Indeed the International has more than a trace in it of anarchism, with its verse about soldiers turning on their officers and shooting them. The development of the First International itself led to a flowering of song. Indeed, the first specifically anarchist songs in French, date from the 1870s, produced by refugees in the Swiss Jura. The first, The Right of the Worker, written by the Alsatian Charles Keller, member of both the Commune and the International. It was very popular among the workers of the Jura. The development of a specifically anarchist movement meant that anarchists wanted new songs. They were sick of singing the old songs, identified with the 1789 revolution and with bourgeois republicanism. Among the anarchists who came forward to write songs taken up by the movement were Constant Marie, a veteran of the Commune and a colourful and cordial personality. The police kept him under surveillance right up to his death in 1910. Another was the waiter, François Brunel, who wrote 32 songs between 1889 and 1893. The anarchist papers all printed songs and poetry, especially Le Père Peinard, edited by Emile Pouget which was a principal promoter of ‘propaganda by chanson’. Never again in the history of the French anarchist movement were so many songs (and poems) produced than in the 10 years between 1884-1894. And the songs were used at all the anarchist meetings, benefits, and evenings of entertainment organised by the groups. As one police infiltrator noted of an anarchist evening: “Towards 10pm, the conversations ended and it was the turn of the songs which went on till midnight. Each song was invariably saluted by cries of ‘Vive l’anarchie!’ All the songs were of an ultra-revolutionary character”. Because of the itinerant life of some anarchists, the songs did spread outside their circles, circulating all around the country. Among the main themes of the anarchist songs were antipatriotism, antimilitarism, antiparliamentarism, the celebration of resistance and of life. Charles Favier was arrested for singing Les Antipatriots at a public meeting in 1897 for ‘provocation to murder’, but the charges were dropped. Paul Paillette was one of the main anarchist song-writers of the period. An engraving worker, he produced 10,000 verses among them Heureux Temps (Happy Times) which treats lyrically of the future anarchist communist society and which is still popular in anarchist circles today. He was a poet of harmony, of love and nature and often dealt with the anarchist communist society of abundance where need had been eradicated. He became a full-time singer in the Montmartre cabarets, remaining faithful to the movement. In the period after 1894 other songwriters came forward like Madeleine Vernet. She ran a libertarian orphanage L’Avenir social (Social future) and wrote many antimilitarist songs, continuing this work through WWI and into the ’20s. The great poet and songwriter Gaston Couté also emerged during this period. Regarded by some as one of the finest poets in the French language, his songs have become popular again in France. Born 1880 in the Loiret region, he started writing at the age of 18. He moved to Paris, leading a hard, bohemian existence there and singing in the Montmartre cabarets. He was a poet above all, with his love of the countryside mixed with a strong dose of subversion. His song Le Gâs qui a mal tourné(The Lad who turned out bad), like many others of his work, attacks the clergy and the local dignitaries, whilst celebrating his own resistance to the whole rotten system. He began to collaborate with the anarchist papers edited by Faure, where his texts appeared. He then moved from being a fellow-traveller of the movement to a ‘committed’ singer, supporting the ‘insurrectionals’ current around the paper La Guerre Sociale. This published 60 of his works, which dealt with the social and political events of the time from 1910. Among his most powerful works is Les Conscrits (The Conscripts). He died of TB the following year at the age of 30. Alongside Couté, another important personality was Charles d’Avray, who came to anarchism after the Dreyfus case. His opinion was that “propaganda by song gives the most sure and effective results”. He organised tours all around the country, first of all, in 1907, with the anarchist Mauricius, who also wrote songs, then on his own. At his ‘spectacles-conferences’ he interpreted his repertoire and discussed his ideas with the audience. His topics were patriotism, parliament, free love, the future society. He was continually harried by the authorities and banned in Grenoble. He wrote 1,200 pieces and his songs became an integral part of the anarchist song repertoire. His rousing song Le Triomphe de l’Anarchie (The Triumph of Anarchy) is still popular to this day. Other singers included the individualist Lanoff. In 1889 came a spectacular comeback of the goguettes, supported by those who wanted to defend ‘good chanson’ of a social-political nature. In 1901, La Muse Rouge was created. This was a body uniting most of the socialist and anarchist chansonniers, among them Constant Marie and Paillette. It ran goguettes and participated in festivals organised by workers’ associations and political groups, bringing out a magazine La Chanson Charles d’Avray Ouvrière (The Workers’ Song). It supported the old song-writers and encouraged new ones like Eugène Bizeau. An agricultural worker, he then became skilled as a vintner, something he exercised all of his life. Self-taught, he subscribed from the age of 14 to the anarchist paper Le Père Peinard. His anarchist songs were highly popular in the goguettes. He remained true to his ideas up to the last dying at the age of 106 in 1989! The World War dealt a great blow to La Muse Rouge. Two of its singersongwriters were conscripted and died in the trenches. After the war, the cultural and political scene was never the same and there was a severe decline in anarchist song. The Communist Party attempted to take over La Muse Rouge. It failed, but the subsequent split, and the coldshouldering by the Communist Party, led to its rapid decline. The post-war years One of France’s most famous and most popular singers, Georges Brassens, was a militant of the Fédération Anarchiste, writing his first article for their paper Le Libertairein 1946, subsequently helping editing it. Whilst his views were presented forthrightly in his songs, his subversive intentions were achieved by a mocking and satirical approach. His rise to fame led to a preoccupation with his career, though he continued to contribute generously to the cause and gave free performances at fundraising galas for the anarchist movement and appears to have maintained his anarchist views up to his death. A figure of prowess of the Left Bank intellectuals and bohemians, Boris Vian was a jazz trumpeter, author of 10 novels and writer of 400 songs, many of which he performed himself. His most famous song Le Déserteur (the Deserter) strongly expresses his antimilitarism, a theme often touched upon in his work, along with his hatred of organised religion and bureaucracy, key elements in his anarchism. Jacques Brel, a Belgian who spent much of his life in France, was another celebrated singer and song-writer of this period who also included a fierce antimilitarism, militant atheism and savage satires on the bourgeoisie in his songs. He was careful, however, not to be drawn on his politics in public. Unlike Léo Ferré, who regularly included references to anarchism in his songs, as did Georges Moustaki, a Greek born in Egypt who has spent most of his life in France. Both have made contributions to the anarchist movement and performed in benefit galas. Unlike Brassens’ more gentle approach, Ferré’s songs sometimes contained incitements to insurrection and revolt. He was excluded from broadcasting over ORTF (the French version of the BBC) in the ’60s because of his anarchist opinions and his opposition to the Algerian war. One of his songs, Complainte de la Télé, lays into French TV as a prostitute touting for trade, and the télécratie, government by television. In other songs he fires broadsides at the pap served up on TV, which he sees as a morphine for the masses. Moustaki celebrates the Spirit of Revolution in his Sans La Nommer (Without naming her) and his tribute to May ’68, written during the events in Temps de Vivre (Time To Live). Since 1981, the radio station of the Fédération Anarchiste, Radio Libertaire, broadcasting over the greater Paris area, has given space to committed chansonniers to perform over the air-waves. This has led to a revival of the old songs, like those of d’Avray and Couté. Singers like Serge Utgé-Royo and Vanya Adrian Sens, openly committed to anarchism, perform regularly on Radio Libertaire. Perhaps with the rebirth and growth of the French anarchist movement, anarchist song might revive as part of a living revolutionary culture. The spontaneous creation of anarchist militants is a long way from the music stars, who might mention anarchism, or an aspect of anarchism in their songs, and who, finally, may place their careers above the anarchist movement. Both in their way have contributed towards the development of a common libertarian identity among French anarchists and to the establishment of anarchist ideas as an important part of French popular culture. The French Situationists made their own unique contribution to subversive French chanson. In 1974 appeared the album Chansons du Prolétariat Révolutionnaire — pour en finir avec le travail (Songs of the Revolutionary Proletariat — to end work). It was entitled Volume 1 though any further volumes never appeared. Alongside one genuine anarchist chanson from the 1890s appeared a number of works professing to be written by a member of the Bonnot Gang, the Makhnovists in the Ukraine and Spanish anarchists. Pseudonyms hid the real perpetrators — Guy Debord, Alice Becker-Ho and Raoul Vaneigem, leading Situationists. Becker-Ho had written one song that was written in 1968 for the Committee for the Maintenance of the Factory Occupations but really the Situationists had employed détournement (their tactic of subversively transforming images and sounds) using well-known French tunes and substituting revolutionary lyrics. One of their songs, La Makhnovschina (supposed to be the song of the Makhnovists in the Ukraine, inspired by the anarchist Nestor Makhno) was given the full-on punk treatment in the ’80s. Les Beruriers Noirs had emerged in the music culture that developed in squatted buildings in Paris in the late ’70s. Starting in 1978, they dealt directly with songs about anti-militarism, against prison, and then increasingly against racism and the racist Front National. They also criticised the social order in general in their songs and were explicitly anarchist. Indeed they were far more revolutionary than the British punk bands that had inspired them. Aware of the danger of commercialism, they disbanded in 1989 when they saw this starting.